This morning in the shower, I came up with a really awesome theory. This theory systematically categorizes all citizens into eight distinct kinds, each of which has different effects on a given country’s political system. This piece will be one of the most original, and, in my view, important pieces I have written on this blog. Interested or Disinterested (I or D)–some citizens have a personal stake in the policy outcome of a given issue, while other citizens do not. Caring or Apathetic (C or A)–some citizens take political action to advocate for or against a given position on an issue, while others do not. Knowledgeable or Ignorant (K or G)–some citizens know how the proposed policy options will affect themselves and society, while others do not. There are a few things to note about this. Many people frequently fail to see the distinction between having a personal interest in a specific policy outcome and caring about that policy. Many people care about issues that do not affect themselves directly, while many other people are unaware or unwilling to pursue policies that might very well benefit them. A person can support a given policy purely on the basis that this person believes it will help others. By the same token, a person can fail to support/oppose a policy even though that policy would objectively be beneficial/harmful to them. We should also note the frequency with which people misidentify their own types. Many people believe themselves to be knowledgeable about an issue when in fact they are not. Many people also believe they have interests where they do not have them, or believe that they are without interests in cases where those interests do in fact exist. To use a popular current example, if I think Obamacare will not affect me when in reality it is going to make me change my healthcare plan to a plan I will like less, I believe I do not have a personal interest in whether or not Obamacare passes when in fact I do. If I think Obamacare is going to raise my premiums when in fact it is going to lower them, I think I am knowledgeable about its effects when in reality I am ignorant. We rarely recognize ignorance in our own actions, and it’s important to remember that we may be mistaken about our own place in the schema for any given issue. Get drones to care about the issues that affect them. Teach drones to know about how an issue affects them, and thereby inspire them to care. It is much easier to get drones to care about something than it is to teach them about it, because drones are not usually especially interested in learning about politics–if they were, they would have done the research on their own already, and they wouldn’t be drones. They are consequently frequent targets of misleading political ads and false rumors, with the aim of turning them into ICGs, though more scrupulous awareness campaigns will attempt to make them into ICKs. The masochist is being benefited or harmed by the policies in question and cares deeply about them, but unfortunately does not understand how the policies work or which policies are advantageous. The classic case is the poor guy who votes republican. Masochists are foot soldiers in a war against themselves. A masochist is a gift to the political forces that oppose his interests, because he will support them even as they are worsening his life. He is a free vote, they get his support not only without benefiting him, but in the course of actually harming him. Political campaigners often try to lift foggy ignorance surrounding ICGs and turn them into ICKs, but it is often quite difficult to pull off, in no small part because ICGs usually believe they already are ICKs. Abusive fathers are political paternalists–they get involved in political issues that have nothing to do with them and generate harmful outcomes by so doing. An example might be someone who opposes gay marriage in order to save the souls of gay people. This person is well-intentioned–all DC types are focused on what they believe to be the social good rather than their own, but because abusive fathers has fundamentally misunderstood the effects of the policies they advocate or oppose, they end up harming others without meaning to, in much the same way that a real abusive father might delude himself into believing that when he beats his children he’s making them into better people. They are to be admired for their selflessness, but condemned for their harmfulness. DCKs can lapse into being DCGs when confronting issues they have not yet thought much about or done much research on. Noble savages live in a state of blissful ignorance. Not only do they not know or care about the policies in question, but these policies do not even affect them. They have no desire to participate in the policy debate nor do they have any reason to do so. They are justified in their ignorance and in their non-participation. The worst thing that we as a society can do with a noble savage is to force him to move to the city, to participate in politics through some kind of mandatory vote, because the noble savage has no relevant political principles. Instead, he will try to get something unrelated that he wants in exchange for his support. Noble savages that become deeply involved in politics will trade their votes for cash, future employment, or the passage of other unrelated policies on which they are not noble savages. A noble savage who attains high office will be entirely Machiavellian and mercenary. The best thing to do with a noble savage is to allow him to remain thoroughly apolitical, to resist the urge we often have in modern society to encourage everyone to get involved in politics. Ivory tower academics are isolated from most of the effects of politics by their affluent bourgeois intellectual jobs and lifestyles. They may know quite a lot about the issues, but given their relatively high social status, most issues do not affect them directly. Unlike DCKs or DCGs, DAKs often cannot get themselves motivated about politics unless they have something personally to gain. Despite their unwillingness to participate in politics, many ivory tower academics are social scientists of one kind or another and know quite a bit about politics, but they are largely indifferent to the interests and problems of others. They may spend their entire careers doing trite, abstract, socially meaningless work, either for the paycheck or because they do not care if their work can be operationalized or justified to other people. DAKs are endlessly frustrating to DCGs, who see them as willful parasites capable of benefiting society but unwilling to do so. In some cases, DAKs are disgruntled ex-DCKs who no longer believe that political activity is an effective or efficient use of their time. They have chosen to accept the system rather than fight it. Cynics have interests and know precisely what they are and what policies would most effectively minister to those interests, but they cannot be bothered to act on them. Some cynics are really lazy. Some just do not think that they would gain enough to justify the effort. In every case, the cynic is animated (or rather de-animated) by a sense that political activity is not efficacious or efficient, that they get little in return for the time and effort they invest. Political campaigners try to convince cynics that political action is efficacious and worthwhile, but they face an uphill battle. Cynics are not born, they are made. Beneath the eyes of every cynic lies an ICK, and probably an injured one. Puppet masters are motivated and know what they’re doing. The trouble is that puppet masters have a personal stake in the policy outcome. They know when their individual interest conflicts with the interest of society as a whole, and there’s no guarantee that they will weigh these competing interests in an impartial way. Puppet masters are the only political type capable of acting malevolently, of knowing and willfully harming others. When their interests conflict with the social interest, puppet masters are uniquely positioned to understand the appeal of both sides, and they can use this knowledge to manipulate their fellow citizens into being ICGs or DCGs, leading them into harming themselves and others. Puppet masters are often very hard to identify, because they often express outwardly the same views as the ICGs and DCGs they lead. However, not all puppet masters are malevolent actors–some of them may succeed in subordinating their individual interest to the collective, and when there is true harmony between a puppet master’s individual interest and the collective, he behaves no differently from a DCK. The philosopher king is invulnerable to corruption because he has no stake in the outcome. Philosopher kings, like DCGs, are solely concerned with projecting their political values out onto the world. The difference is that unlike DCGs, philosopher kings actually know what they’re doing. They may come across as paternalist, elitist, or otherwise overbearing, but they genuinely have the best interest of the people at heart and, given power, will act in accordance with that interest. The best statesmen are philosopher kings, and the best political systems are designed to identify and empower a given society’s DCKs. No person is the same type for every issue. Every one of us has been every one of these types on some issue or another at some point in life. That said, some of us are much more frequently some types than others. If a political system can consistently find and empower the people who are most frequently DCKs on the largest number of political issues, that political system will thrive for centuries. Given that reasonable people disagree on what is “knowledge”, this likely does not involve passing some kind of test, but identifying those who spend many years of their lives reading, thinking, and writing about diverse political issues. Different political systems encourage and reward different types. Many modern democracies prize caring above knowledge and are consequently run by ICGs, DCGs, and, if you’re especially pessimistic, ICKs. Many political systems decay over time, and as a result the ruling types change. Aristotle contrasts his good governments (aristocracy and monarchy) with his bad forms (oligarchy and tyranny). In both of these cases, governments once run by DCKs are gradually taken over by ICGs, DCGs, or ICKs. Democratic states tend to be overrun by all three, though to some degree they mitigate one another’s worst excesses. The focus of our political theory should be on making DCKs the center of our political universe while remaining consistent with checks and balances and a liberal concern for liberty. This is what sophiarchism sets out to do. 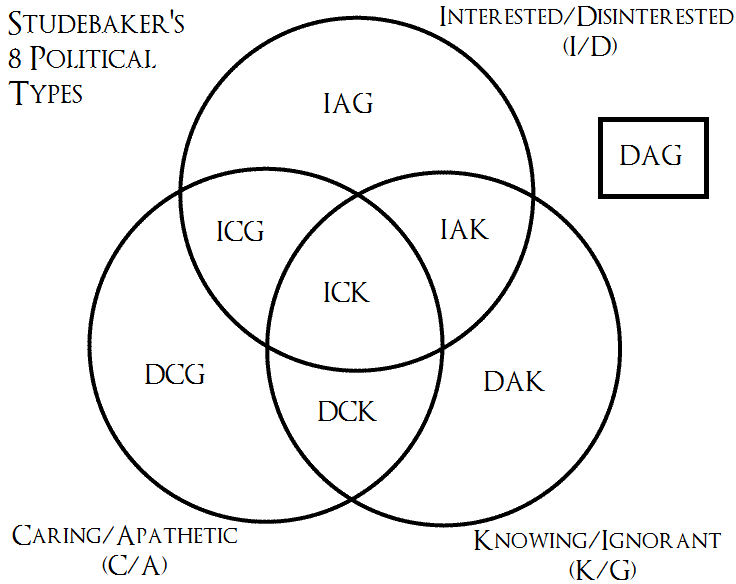 I’m an IAK: The Cynic. Thank you! Interestingly, to this point, every person who has contacted me in response to this post to self-identify a type has picked the cynic. Interesting ideas. – Let me take a step back and talk about “knowing”. What does that mean? We are all exposed to prejudices, biases, and sources of bad information. Take almost any subject matter and even so-called experts can disagree. As a matter of fact, you can probably always pull out an expert from somehwere, who supports your particular idea with “scientific” facts. While I think there are better and worse positions for any given issue, you’re right that smart people are not going to agree on many things. For that reason I think it’s better to look for the people who have invested lots of their time considering political issues than it is to look for any specific positions, on the presumption that those who spend more time considering are more likely to come to the better positions, whatever those may be. Wow that’s a really detailed and interesting set of concepts. I like how its far more original than the usual stale political compass. One thing though. I would disagree about your depiction of the abusive father. People don’t always do harm just because they don’t fully understand the issue. For example, someone may donate to a charity or do volunteer work if they think it will help people, even if they don’t fully understand how. Likewise an ignorant but caring person could vote for welfare policies because they think they will help, even if they are not sure how. I agree that a DCG can do good things in the same way that an abusive father isn’t necessarily always awful to his children. The trouble is that it’s by luck and good fortune rather than knowledge and consequently cannot be relied upon. You wouldn’t want to put a DCG in a position of power in which he would inevitably have to rely on his judgement. Many of the worst tyrants in human history have been well-intentioned DCGs.